This article gives simple step-by-step instructions for making a bunny ears craft with preschool students. The concept behind the craft is making a simple headband or hat that has the ears of a bunny attached to it for children to use in pretend play. With three variations below, make a set of bunny ears for each child, and get your group moving and grooving to some bunny dance steps. Cut a paper strip from white poster board about 2 1/2 to 3 inches wide and long enough to fit around the child’s head. 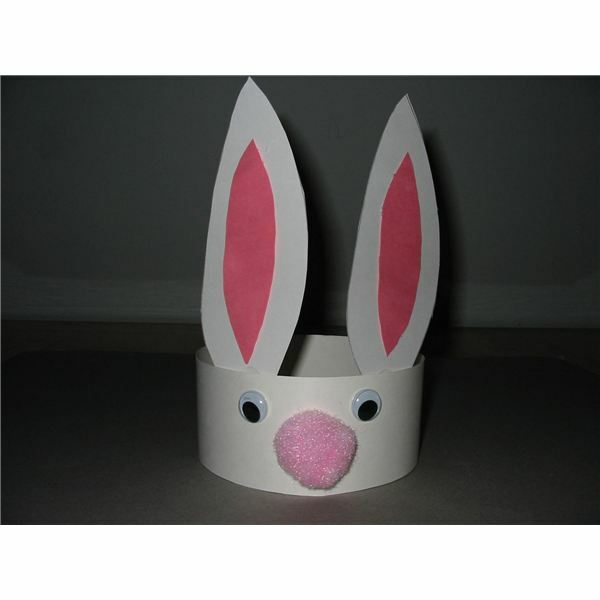 Make templates of rabbit ears, and invite the children to trace around the template and cut out two ears for their headband from white poster board. Cut two pink centers for the ears traced from a smaller sized template. Have the children glue the pink centers onto each white bunny ear. 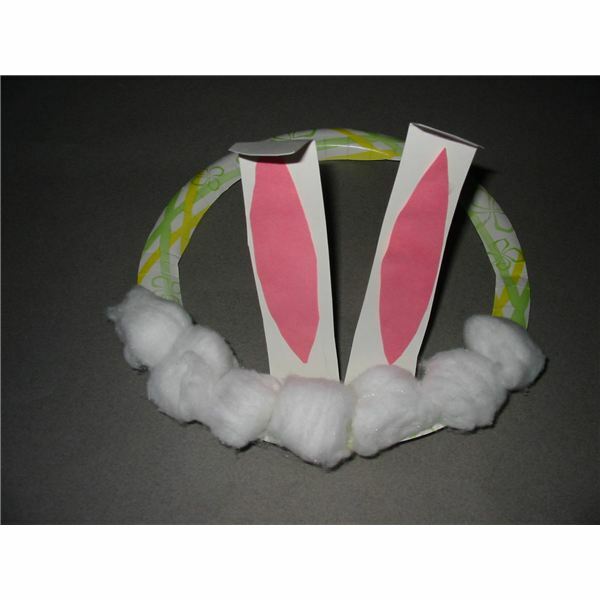 In the center of the main headband, have the children create a bunny face. Help young children draw eyes on the band. With older children, you have an option of using plastic movable eyes; however, supervision is advisable as small pieces may become a choking hazard. Glue a pink pom-pom or cotton ball nose in the center. Attach each ear above the eyes with heavy duty glue or a stapler. Remember to cover all stapled areas with a piece of tape to prevent cuts or hair pulling by the metal staple. Fit the band to the child’s head and staple closed. Cut a headband from the white poster board between 2-3 inches wide and long enough to fit the child’s head. Cut a strip from the lid of an egg carton, and then cut this cupped strip in half. These will become the bunny ears. 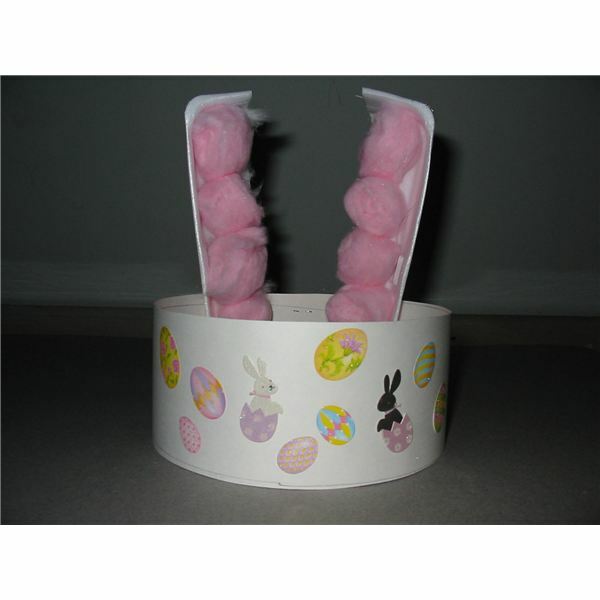 Have the children glue cotton balls inside each cupped bunny ear. While the ears are drying, invite the children to decorate the headband piece. These can be decorated with crayons, markers, and/or stickers. Fit the band to the child’s head and staple closed. Cover the stapled areas with tape to avoids cuts and pulled hair. Attach each bunny ear to the back of the headband with the stapler. Fold the paper plate in half. Cut around the inside of the rim leaving a two-inch part uncut. Older children may want to do the cutting with your help. Open the paper plate and bend up the uncut center portion. Cut down the center, making two rabbit ears. Cut two smaller center ear portions from pink construction paper and glue these onto the white bunny ears. Curl down each ear at the top. Allow the children to glue cotton balls along the rim of the hat (front section). Place the rim on the child’s head as a hat with the bunny ears in front. A preschool bunny ears craft is a fun and easy project for children to make for Easter or the spring season. Be sure to have a camera ready so the children can model their creations! The information offered in this article is based on the author's personal experience as an early childhood teacher.